While wandering around the streets of Kamal Nagar ask any person to point the direction for the best chaat place around and every one will surely mention one place that is ‘Vaishnav Chaat Bhandar’. 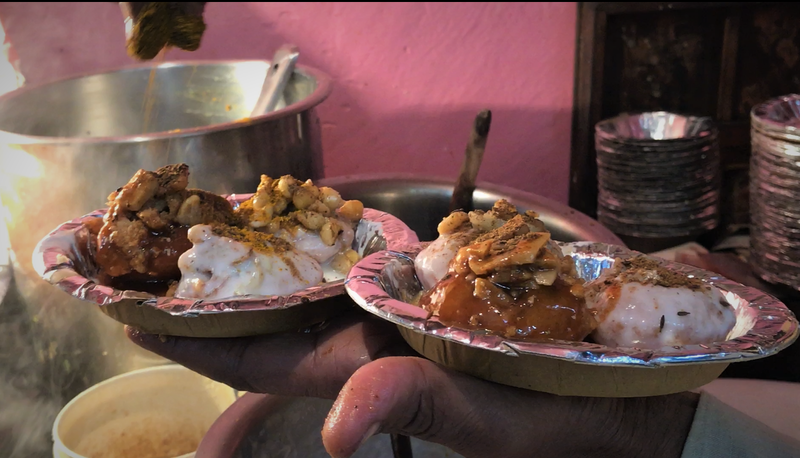 This incredibly famous chaat bhandar is the go-to for every person in Kamla Nagar who develop cravings for some sweet and tangy chaat. According to this place’s humble owner this place is around six decades old and has a very constant trend of satisfying their customers throughout. As soon as you enter the lane which carries this amazing wonder you will see a swarm of people mushrooming around this joint from quite a distance. Even the name board of this place screams how old this place must be as the alphabets are carved on a sandstone rather than using modern day techniques. As we believe that with every change in region in India , the flavours of the chaat has twists and turns of its own. 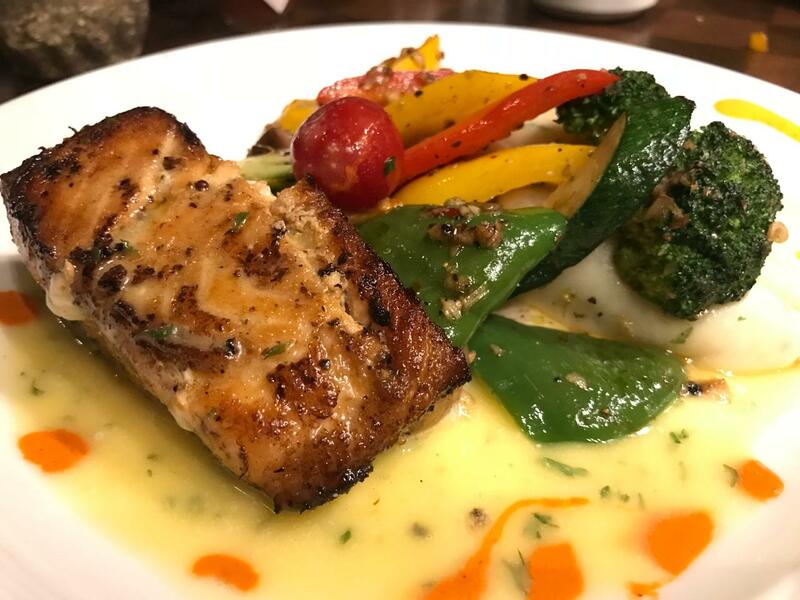 As you proceed into this place you will see the barbecue grills with seekhs of very delightful marinated paneer and soya chaap which tells you that this place is much more than just chaats and golgappas . Their vast menu includes pav bhaji ,paneer tikka and various types of soya chaap. The owner of the shop recommended us to try their famous ‘Bhalla Papdi‘. 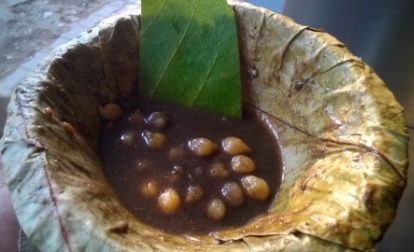 It was basically a dish in which bhalla and few papdis are soaked in dahi which is then topped with chickpeas and potatoes along with some boondi, to add some more flavour to it , tamarind chutney and more dahi is added, then to give a final touch different combination of spices is sprinkled on to it. 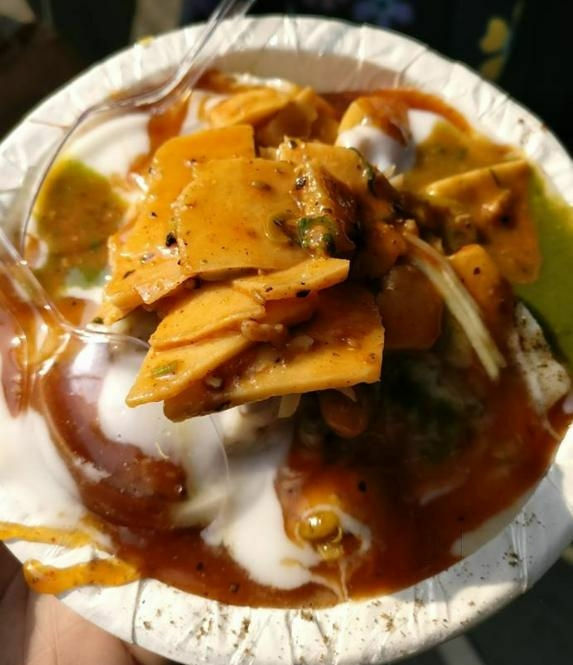 One particular thing that can be observed is that the chaats here are prepares in a Old-Delhi-style as it is topped with kachalu which is a trend that Old-Delhi chaat vendors follow a lot. This dish was delicious as it kicked the taste buds at all right places with perfect temperature of dahi. All the combination of the chutneys and spices worked perfectly for us. Next in we dug into to the classic pav bhaji , it was served with loads of butter on the bhaji and as well as on the buns too, it was served along with some onions and lemon slice. The flavour of the pav bhaji was amazing with bhaji being slight different in good way from the usual ones. 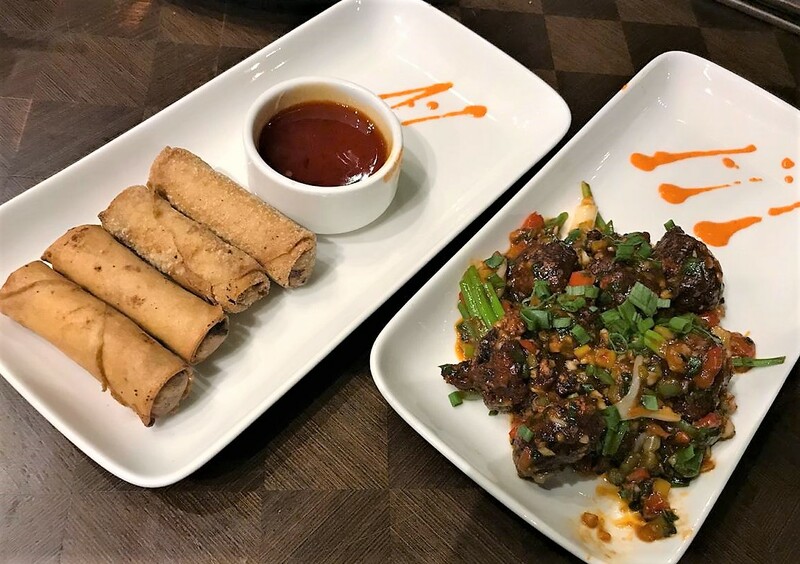 Even though there is no such concept as ‘ seating arrangements’ at this place , but the flavours and varieties of the tidbits that this place offers are worth a try. Some call it the “Vegetarian Omelette” or the Indianised Pancake, but it is popularly known as the ‘moonglet’. 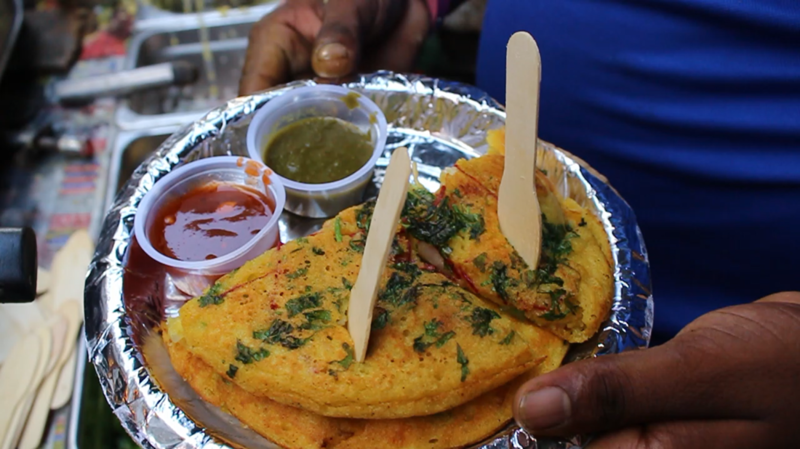 Moong dal and Omelette, two food items that seem to not fit well together have been combined by the vendors of Karol Bagh to give us the super delicious ‘moonglet’. In simple terms, ‘moonglet’ is a moong dal cheela, but at the same time, it is so much more than that. K.B. 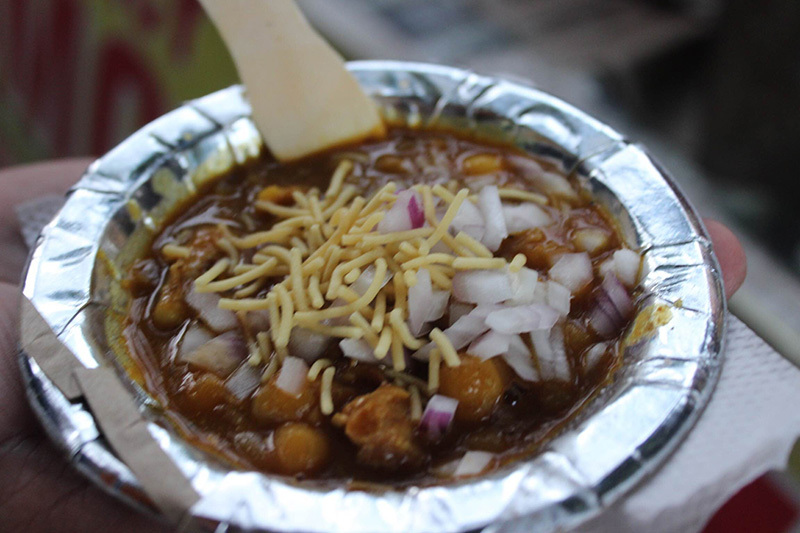 Chaat, located in Karol Bagh, is known in the neighbourhood for its scrumptious butter soaked ‘moonglets’. One can find multiple vendors selling this delicacy in this area, but it is for K.B. Chaat’s ‘moonglets’ that people line up and wait patiently. Located opposite the Stellato’s showroom, the stall is set up at 3 pm and keeps serving its various chaat items till 10 at night. Apart from the ‘moonglet’, they also sell other basic chaat items like Gol Gappe, Aloo Tikki, Chole Kulche, among others. KB Chaat first came into service in 1970 and was initiated by the father of the present owner. The owner, Dinesh Kumar, introduced the ‘moonglet’ in the stall’s menu about 6 years back. Since then, this dish has become popular across Delhi and has become synonymous with the stall’s name. The cheela moonglet is prepared live and the process is a visual treat. It is made from moong daal, stuffed with onion, capsicum, sweet corn, etc and is cooked solely in layers and layers of butter, later topped with beetroot and coriander. Watching the moonglet being prepared is truly mouthwatering and makes it taste a lot more delicious. One can enjoy the cheela with 3 different types of chutneys, imli, mint, and a special one made out of khajoor. The price of the cheela varies from rupees 50-70, depending on the quantity of butter. K.B. 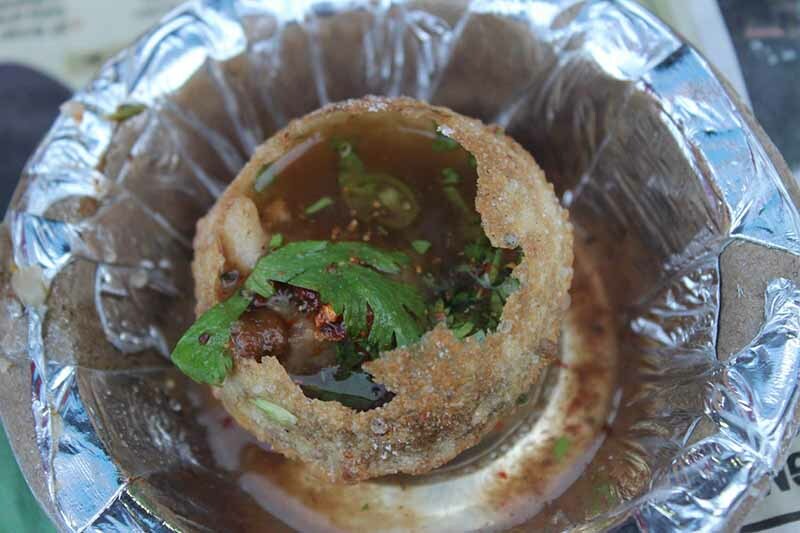 Chaat is easy to reach, the nearest metro station being Karol Bagh on the Blue line. The ‘moonglet’ is entirely made from vegetarian ingredients, yet it still manages to imitate the texture of an omelette. It makes for a perfect and relatively healthy evening snack. This year, K.B. Chaat is trying to expand its reach by being a part of the NBT Flavour Fest- Street Fusion Food Court taking place at Baba Kharak Singh Marg on the 14th and 15th of October. The festival is curated by Delhi Food Walks and aims to bring to the forefront the talented minds behind the various fusion food items. I remember vividly, the must visit place in Chandni Chowk for fruit chaat where my mother used to take me during my childhood to was Bishan Swaroop Chaat Corner. Sitting on the stairs of Jain Library and slurping the leftover juices of fruits in a dona mixed with khatta meetha (sweet and sour) masala (spices) are some fond memories of those days. I visited Bishan Swaroop Chaat Corner yesterday afternoon to grab a dona of mixed fruit chaat and was saddened to hear that Bishan Swaroop had passed away one and half months back due to paralysis. 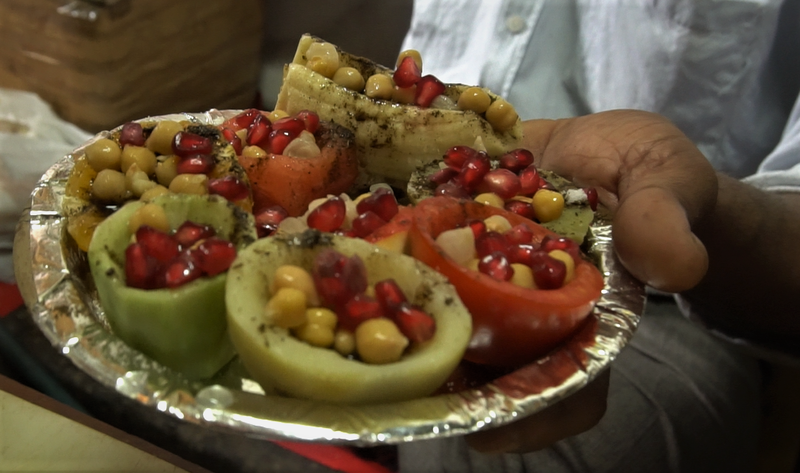 Bishan Swaroop Chaat corner has been serving fruit chaat since 1923. Started by Lallu Ram, the father of Bishan Swaroop, the shop is now run by his nephews, Jitender and Nand Kishore (contact no. : 9899648131). The address is 1421, near Mahavir Jain Library, Chandni Chowk, and it is open from 12 noon to 8 p.m. 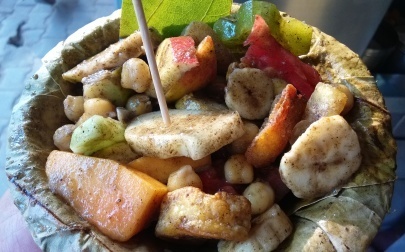 I had mixed fruit chaat (Rs. 40 per dona) which contains tomato, star fruit, guava, watermelon, cucumber, beetroot, apple, orange, papaya, freshly fried potato and chickpeas, all mixed together. Spices such as roasted cinnamon, black pepper and chaat masala are sprinkled along with lemon juice and tossed with coriander chutney. The fruits get coated in different flavours and taste delicious but unfamiliar. 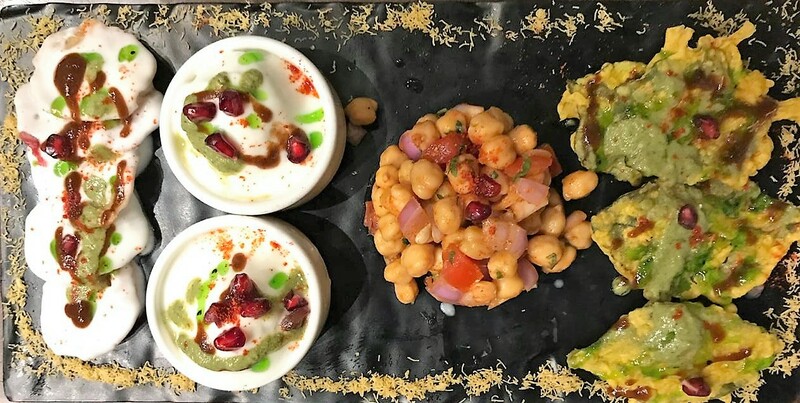 Interestingly, Ashok who was doing this magical mixing of lemon juice, masalas and chutney, serves the mix fruit chaat in a dona with a toothpick to eat the fruits and a small spoon to slurp the leftover juice with the chickpeas. I slurped the leftover juice to the last drop and ate chickpeas soaked in sweet and sour juice. 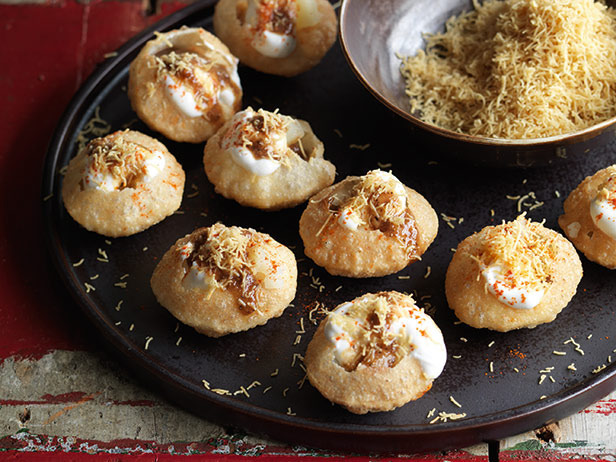 Other kinds of chaat to try at the Chaat Corner are aloo chaat (Rs. 50 per dona), sweet potato mixed with fried potatoes (Rs. 50), fried aloo and chhole (Rs. 30), and aloo kachalu (Rs. 50). 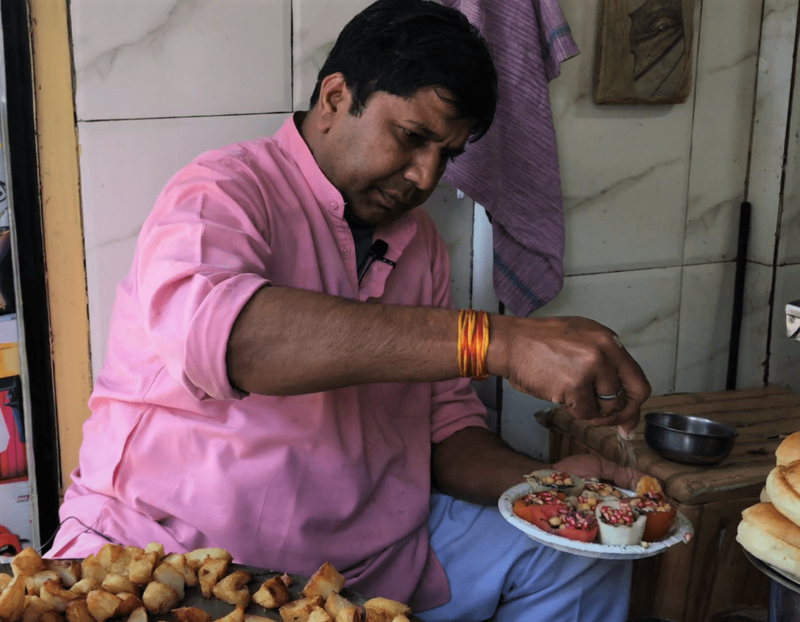 I am sure Bishan Swaroop’s soul would rest in peace as this wonderful task of making such delicious chaat is being continued by his talented nephews. Guess what Old Delhi is back with? I am delighted to announce that Babu Ram and his family members are back from the villages of Moradabad, Uttar Pradesh to the by-lanes of Old Delhi- Sitaram Bazar. Guess what he is back with? He is back with the ‘Daulat ki Chaat’, a delicacy of winter. It seems winters are just here! I spotted Babu Lal, a Daulat ki chaat hawker, at the Chhata Shah ji lane, near Barsha bulla chowk where the famous lotan Chole Kulche sells his scrumptious meal. Till 10 am, you can find Babu Lal at Chhata Shah ji, and from 11 am to 7 pm at Maliwara in Chandni Chowk. 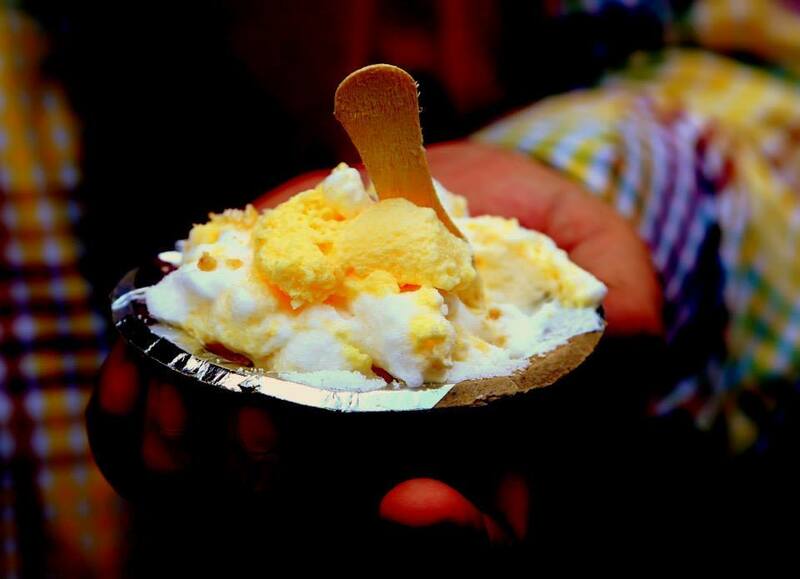 A dona of Daulat ki chaat costs Rs 40. Babu Ram’s family members (kinari bazaar- Khemchand, Gali Paranthe Wali- Rakesh, Dariba Kalan- Babu Ram and Maliwara- Babu Lal) are there in the alleys of Old Delhi with their khomchas selling Daulat ki Chaat. The winter delight is available until Holi. So, it is the time for a winter pilgrimage, in the words of Pamela Timms, to the gullies of Old Delhi to savour the delicate dessert.